Trini Lopez has sold millions of records. MILLIONS. He was born in Dallas in 1937 and grew up in the Little Mexico area of town. He started his career when he was a teenager at Crozier Tech High School, singing and playing guitar in a popular combo. He played at dozens of school dances and parties, and, with a steady and faithful following, he was much in demand at countless venues around town, including a regular 2:30-6:30 p.m. Sunday matinee spot at Club Vegas (Oak Lawn & Lemmon), one of the many clubs in the city run by Jack Ruby. Jack Ruby — the personable Latin from Manhattan, reports surprising success with his Sunday night Fiestas at Club Vegas…. Trini’s first single was “The Right to Rock” — the first song he ever wrote — recorded in 1958 on a small Dallas label called Volk (did anyone else ever record for this label?). It’s a great little rockabilly number, but it didn’t really make any waves outside of Dallas (although it’s since found new life in the cult-y world of vintage rockabilly reissues). Trini then recorded a few singles for King, but those went nowhere as well, and Trini and his combo continued to play small clubs in and around DFW, wondering when the big break was going to come. After a gig in Wichita Falls, Trini met fellow-Texan Buddy Holly who had been impressed by the young singer’s performance and encouraged him to contact his producer, Norman Petty, about recording some tracks at Petty’s studio in New Mexico. Trini jumped at the chance, but, unfortunately, the time in the studio at Clovis turned out to be a career low-point (see below for a link to the Gary James interview in which Trini gives a bitter and scathing account of that whole experience). Trini returned to Dallas and immediately fired his band and started a new one, determined that he would succeed, despite the prevailing (spoken and unspoken) racism he was continuing to run up against in the music business. A few months after Buddy Holly’s death, the Crickets contacted Trini and asked him to travel to Los Angeles to discuss the possibility of becoming their new lead singer. Trini, seeing this as the big break he’d been waiting for, disbanded the combo and set out to the West Coast alone. The “audition” never really materialized, and Trini was stuck in California with no money and no prospects. He played a few small clubs and then settled into PJ’s for an extended and very successful engagement. It was there, in 1963, that the “big break” finally happened: he was discovered by producer Don Costa, who recommended that Frank Sinatra sign him to Reprise Records. 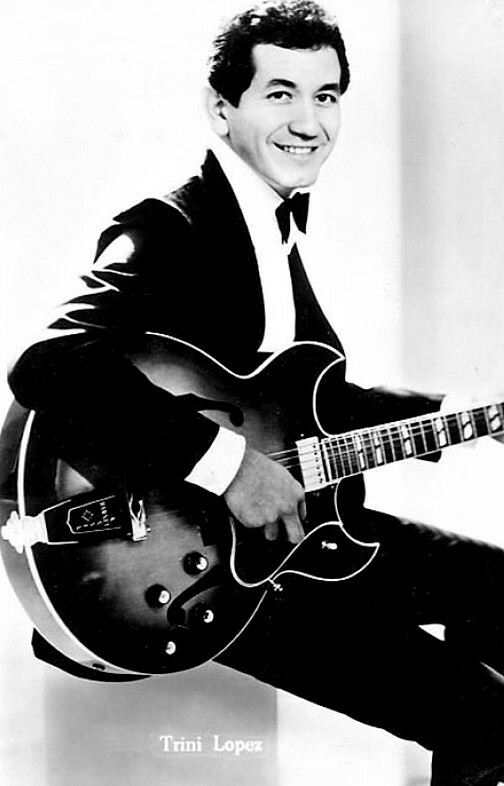 Next thing you know, Trini had recorded his debut album, “Trini Lopez at PJ’s,” and the first single, “If I Had a Hammer,” was a huge smash hit, selling millions of copies and reaching #1 in 38 countries. 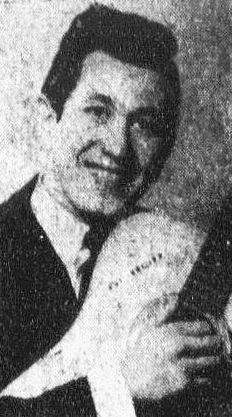 Trini Lopez became an international star. At the beginning of 1964, he was booked for a series of shows in Paris where he shared the bill with The Beatles, just as they were about to hit big in the US (their Ed Sullivan appearance was less than a month away). Beatlemania was in full force in Europe, but Trini was also getting his share of attention. A couple of interesting things, Dallas-wise. 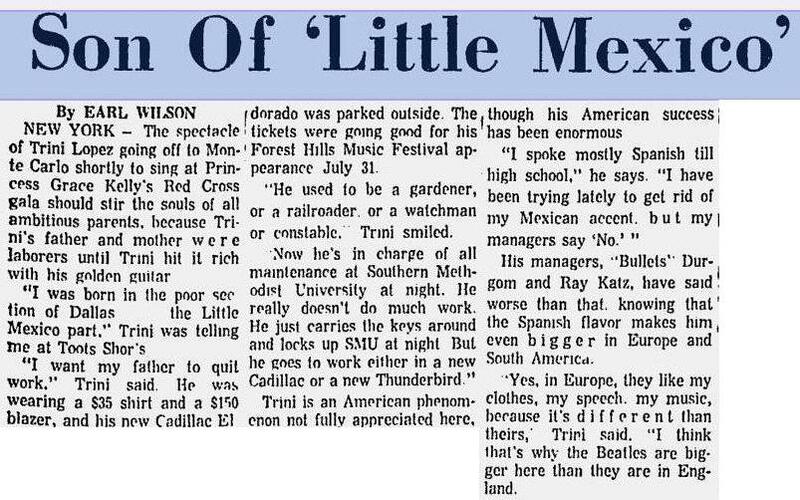 My Trini Lopez knowledge is fairly scant, but having read a lot about him over the past couple of days, the one thing that keeps coming back when he talks about the Little Mexico section of town (invariably referred to by him as a “ghetto”) is how violent a place it was. He also recounts the deep and dehumanizing racial prejudice he and other Mexican-Americans experienced living in Dallas. When he left for Los Angeles in 1959/1960, he left for good. He came back regularly to visit his family (I remember having him pointed out to me by my parents in a restaurant once), but I’m not sure he would have ever wanted to live here again. Below are a few random interviews and tidbits. Full Dallas Observer interview by Robert Wilonsky is here. There are a lot of garbled accounts of Trini Lopez’s career scattered across the internet. One that seems mostly right is here. The essential interview with Trini by Gary James I’ve mentioned a couple of times above, is here. I think the interview is from 2002. His memories of growing up in Dallas are interesting, unvarnished, and well worth reading. He also talks about the racial prejudice he met with when attempting to record with Norman Petty and the resulting mutiny of his band in Clovis which led to their being fired by Trini immediately upon their return to Dallas. Read Trini’s tribute to his parents — an essay he wrote in the early 1980s — here. Trini Lopez is still performing! His official website is here. 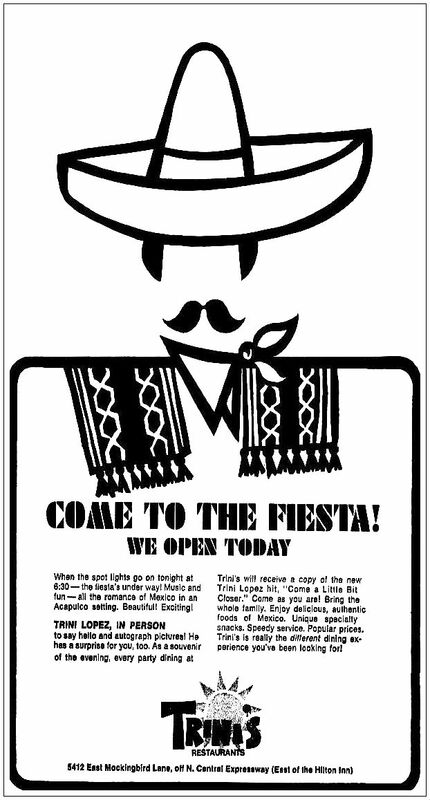 Remember Trini’s Mexican Restaurant, in the strip center SE corner of Mockingbird and Homer/SW corner of Mockingbird and McMillan? It was a favorite of my family in the 60s and 70s. Also, I ran across Trini Lopez in the mid 80s playing in the bar at Mariano’s (back when it was a nice bar, dark, cool with strong margaritas, before they turned it into a fern bar). I booked Trini for summer semester sockhops at SMU in 1959 or 1960. And I was at l’Olympia in Paris when he was top of the bill, above the Beatles! Trini, remember singing at some of the dances at North Dallas High with David and the Misters with your brother. I told my sister back then and asked her if it was true you were related. She said yes and something about you and lunch money -she is still waiting for her money. Her name is Mary Louise.